In celebration of the 23rd Winter Olympic games in PyeongChang, Lake Placid’s Regional Organization Of Sustainable Tourism (ROOST) recently held its own winter sports competition, the Empire State Games. Featuring 27 competitive events, the games attracted athletes from across the US and Canada. 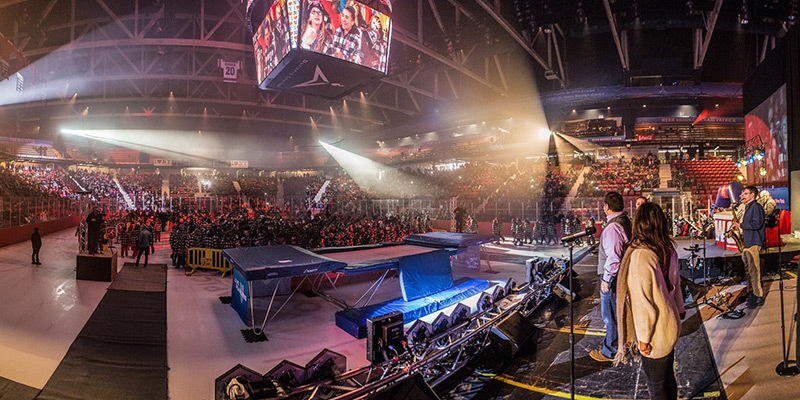 Just like the Olympics, New York State’s own winter games was well supported by spectators and kicked off with an impressive Opening Ceremony. This took place in Lake Placid’s historic ice hockey stadium and featured a lighting rig comprised solely of ADJ fixtures. Lake Placid has a rich history of winter sports. It has hosted the Olympic Games twice – in 1932 the third games were held in the city and they then returned in 1980 for the 13th edition. It was at these games that the USA ice hockey team – at the time made up of mostly collegiate athletes and not predicted to advance beyond group play – defied all odds to beat a veteran USSR team and go on to win the gold medal. Known as the ‘Miracle on Ice’, this momentous moment in sporting history took place in the very same arena that hosted the opening ceremony of the 38th Empire State Winter Games. Now known as the ‘Herb Brooks Arena’, the venue was named after the man who led Team USA to that legendary victory. As the business grew, Eric’s next significant investment was in ADJ’s Vizi Beam RXONE. Twelve of these fixtures were used for the Opening Ceremony to create mid-air beam effects within the 8000-capacity arena’s cavernous space. A combination of its tight beam angle and strobing feature were used to create flashing ‘fingers’ of light that filled the arena to dazzling effect. Having secured the Empire State Winter Games contract back in October of last year, Eric decided it was time to invest once again. He visited the LDI tradeshow specifically looking for a powerful and flexible fixture that could be used for this ambitious production and decided that ADJ’s new Vizi BSW 300 was the perfect choice. Twelve of the units were deployed around the arena and used at different points throughout the Opening Ceremony to wash the ice with vibrant colors and to fill the arena with sharp mid-air beam effects. In addition, the fixtures were also used to project custom GOBOs of the Empire State Games logo, as well as its sponsor’s logos, on to the ice. ADJ’s own Edgar Gonzalez was brought in to program the show, which spanned two universes of DMX and was connected together using Accu Cable DMX cables. In order to allow Edgar to create immersive beam effects, two ADJ Entourage professional-grade faze machines were deployed – one at either side of the arena – which created a hazy atmosphere throughout the venue. In addition to lighting the ice and creating aerial effects throughout the whole space, Eric’s team also provided lighting production for a stage at one end of the arena which was used for a live band performance. Sixteen of ADJ’s unique 3D Vision Plus panels units were arranged across the front of the stage to create eye candy effects, interspersed with two ADJ Dotz Matrix fixtures that served as stage blinders. The stage setup was completed by four ADJ Inno Pocket Z4 movers, and a pair of ADJ Fog Fury Jett LED-infused vertical foggers which were positioned on either side of band.